UPDATE: Three days after OhmyNews asked its readers to join the site as supporters, some 1100 readers have confirmed their financial contribution so far, with 4015 pledging the commitment according to an online counter posted in the dedicated page. Mr. Oh's tactic is well known among some American advocacy media circles, notably Pat Robertson, a conservative Christian televangelists. Fund-raising as a means for supporting a media organization has traditionally been a favorite strategy of many partisan and religious media. You wouldn't believe it is a pure coincidence that Mr. Oh had attended classes on the media management in Regent University before he launched his citizen media venture in Korea. No wonder the most enthusiastic early participants so far seem to be liberal types frustrated with the overtly conservative policies of the incumbent government. It is doubtful if OhmyNews' direct appeal to readers for a financial commitment will be successfully emulated elsewhere if your media is serving the non-partisan general audience. On another note, OhmyNews International has published a partial translation of Mr. Oh's open letter to its readers. OhmyNews is eyeing up to 10,000 supporters to join the site by the year-end, realizing a financial turn around by then. It remains to be seen, however, if the current momentum will hold up even after the initial buzz and enthusiasm starts to dissipate. OhmyNews, a pioneering Korean citizen journalism site, lost KRW500M or about US$400,000 this year alone, Oh Yeon-ho, the founder and CEO of OhmyNews disclosed in an open letter published on its news site Wednesday. And he fears it would lose more money as advertisers keep slashing marketing budget amid the global financial crisis. Mr. Oh believes, however, if 100,000 readers join OhmyNews as supporters, paying KRW10,000 a month, it would achieve its financial independence without necessarily relying on advertising dollars. "For a citizen media to remain healthy and preserve its editorial integrity, it will have to earn at least 50 percent of its income from the sales of content or paid subscriptions. Despite our best effort, OhmyNews still relies on advertisers for more than 70 percent of its revenue." Launched in 2000, two years before the Presidential election, OhmyNews quickly rose to prominence by providing a voice for young online readers and mostly liberal political groups. The site has been largely credited for the successful campaign of the reformist president Roh Moo-hyun. Roh killed himself last May in a shocking move that surprised his supporters and political adversaries alike. He had to endure mounting pressure form his opponents, while the attorney's office grilled him with a highly controversial investigation on his alleged slush fund scandal. OhmyNews has gradually lost its standing for the past couple of years, as competing citizen media platforms started to attract its core young Korean readers. The recent global financial meltdown was another blow to its shaky financial structure. Despite its dwindling status, however, OhmyNews still enjoys strong influence among young Korean readers interested in the politics, and during the massive candle light protest last year against the import of the potentially contaminated US beef, the site demonstrated that it can always bite back with a formidable force. Since its inception, OhmyNews has relied on citizen reporters for more than 70 percent of its news content it publishes. At the content side, the site has already achieved its editorial independence. Can OhmyNews pull off another miracle in the finance side as well and stand up again as a sustainable media business? For more updates and developing stories, stay tuned to Planet Size Brain. The World Cup 2002 Korea-Japan, the first World Cup co-hosted ever in the history of the games, gave socio-cultural analysts in both countries an unusual opportunity to compare the behavior of the two historic rivals. Ha Yong-chul, a Korean sociologist at Seoul National University, watched the televised games and noted an interesting difference. Whenever the Japanese national team scored a goal, the soccer stadium in Japan was instantly filled with thousands of flash lights bursting out of ubiquitous Nikons and Canons. Scenes in the Korean Soccer stadiums couldn't be more different. The Korean team equally electrified their home fans as they beat European power houses, game after a game, until they qualified for the semi-final. Unlike Japanese soccer fans, however, Koreans opened their shiny clam-shell phones whenever their team scored a goal, and furiously hit keypads to send text messages or voice mails, sharing their ultimate joy with their family and friends. Far more important to the Korean cyber-generation, it seemed, was to share their bursting emotion with others and network with them, rather than simply recording the events as Japanese did. To untrained occidental eyes, it is not easy to tell the ethnic differences between an average Japanese and Korean. Their socio-cultural behavior, however, are miles apart. In fact, many Koreans find their closest neighbor more foreign then any other country in the world. Obsessed with protecting their privacy, the Japanese cherish their own den. Wa or harmony is the key value in the country and the average Japanese would not dare to stick out of the pack and challenge the social consensus. Even in the crazy morning subways crowded with hundreds of commuters, Japanese do their best to protect their private space. It is actually quite easier than it sounds. By plugging white ear buds in their ears, Japanese commuters are instantly transported inside their own iPod bubble and swaddled in the familiar music. Or they can simply bury their nose in comic books. Solitary souls bent on keeping their private den as clean and serene as possible; the Japanese character is best defined as feline. No wonder the most beloved pet in Japan is the cat. Cats frequently appear in many Japanese animes as well as in countless folklore. Fly two hours to the west and things are couldn't be more different. Koreans are social animals that will live or die in their friend network. They are not afraid to ruffle the feathers, if necessary, engaging sometimes in a heated political discussion on the Net. Chatting over a mobile phone in the subway is not necessarily a bad thing, as long as the noise level is not too high. Korean commuters are usually more tolerant than Japanese to noise in their vicinity. They would spend their short morning commute on networking with their friends, tapping the keypads of their handset to send or receive text messages. Networked souls whose social success is measured by the mutual loyalty to their reference group; Korean character is best defined as canine. In fact, the dog is routinely featured as a reliable guardian of the man in the Korean folklore whereas a cat is usually considered an ominous animal or even a harbinger of coming disasters. As different as cat and dog -- this is a fundamental quandary to many Korean Internet companies that wish to export their service models to the closest neighbor. NHN, OhmyNews, Cyworld and Nexon. The list of Korean Web brands that fell victim to the cultural barriers of Japan is long. Understanding of the feline nature of the Japanese users may help you to engineer a soft landing on the Japanese market, though. One obvious insight Korean companies can gain from Japan's love of a private den is that a blog service would be a good match for them. It would be even more desirable if the service allows users to enjoy bigger storage capacity as comparable to some professional web storage services. And the option for strong control over the personal content and comments would be an absolute must. Even if you are going to launch a social networking service, you would still want to employ blog-like features. Japanese web brands that wish to enter Korean market, on the other hand, would be best advised to do the opposite. Even if you are going to launch blog service, the platform will have to offer enough social networking features that will satisfy the fiercely networked animal that is Korean. Looking back, stockpiling and sharing the data on the Net doesn't necessarily have to be mutually exclusive. Users will need to store information before they can share them with others. Digital cameras that took tons of soccer pictures back in the 2002 World cup are now integrated to almost every handset in the street. 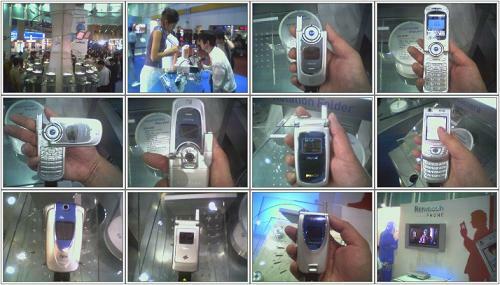 In fact, it is almost impossible to buy a phone without a camera in Tokyo or Seoul. Every man's storage or feline device is now being coupled with every man's networking or canine device. Advice to NHN Japan poised to launch its first search engine in Japan: If your service is going to succeed in Japan, the question for you is just which switch you are going to turn on first--feline or canine. I worship the spirit of creation, worship of force blood heart, I worship, sorrow bomb damage, one of the greatest, popular person get everything. Wealth lose heart, wealth is lost. Therefore we should node popularity. Keep up the fantastic work , I read few articles on this website and I conceive that your blog is really interesting and has got circles of great information. UPDATE: Somebody printed Lee's article on a large banner and hanged it near the make-shift altar set up for Roh in downtown Seoul, reminding Koreans of familiar scenes from the streets of 1980's democratic movement. Citizens are reading them intently after paying tribute for the president. Lee told OhmyNews that he would donate the tips he earned so far-KRW3,567,000-for a Roh memorial hall. Lee Jong-phil woke up Friday morning to find an unlikely jackpot in his cyber tip jar. A day ago, he wrote a long analysis for OhmyNews about the untimely death of Roh Moo-hyun and its implication to Korean politics. Readers, still reeling from the shock of sudden death of the former reformist president, reacted en masse to his article. Lee earned KRW3,114,000 or about US$3000 in just one day paid for by 946 happy readers. OhmyNews has for years allowed its readers to tip their favorite writers whenever they enjoyed any story. This is not the first time the OhmyNews tip jar system surprised its citizen reporters with a huge sum of cyber cash. Kim Yong-ok, a well-known Korean philosopher and television celebrity has once picked over US$30,000 in tips when he confronted the conservative party for its opposition to the relocation of capital city--obviously his story touched upon the hearts of tens of thousands of Korean readers. The tip jar is a micro payment system and nobody is allowed to pay more than KRW30, 000 or about US$30 each time. You can say 'thank you' if you enjoyed an article but if you want, you can say thank you by tipping them--at least in Korea. Buy a cheap jersey through internet marketing. This article first appeared in Harvard Nieman Reports Volume 59 Number 4, Winter 2005. Jean K. Min at OhmyNews International provided the article for Harvard University. In a surrealistic bout of fate, passengers on JetBlue 292 en route to New York were watching their aircraft broadcast live on the screens of the in-flight DirecTV. The pilot was attempting an emergency landing on the tarmac of the Los Angeles International Airport with its front landing gear, clipped at a wrong angle, jutting out of the fuselage. While millions of viewers in America alone watched this nail-biting drama, 140 passengers aboard the Airbus A320 found themselves the subject of live television news unfolding before their own eyes. "It was absolutely terrifying, actually. Seeing the events broadcast made it completely surreal and detached me from the event," said Zachary Mastoon in an interview with The Associated Press. "It became this television show I was inextricably linked to. It was no longer my situation, it was broadcast for everyone to see. It only exacerbated the situation and my fear." A couple of NBC executives were also flying in the JetBlue plane and managed to set up a mobile phone call to report the situation back to NBC headquarters. What if the rest of the passengers were able to hook up to a high-speed wireless network and report the situation inside the aircraft back to a television station? Instead of watching their mile-high ordeal covered by someone else in a remote station, they would have been the ultimate producer of their own news, delivering the story to millions in real time, including on JetBlue's in-flight screens. Citizen reporters of OhmyNews, a unique news organization in Korea, now number more than 41,000 and are no stranger to the sensation that comes from producing their own news. It is this transforming and empowering experience that attracts thousands of "citizen reporters" to OhmyNews every day. Kim Hye Won, a long time citizen reporter of OhmyNews, described her excitement when she found her story published on OhmyNews for the first time: "As soon as I saw my article with my name, Kim Hye Won, attached to it, my heart fluttered. A housewife who for the last 18 years has been caught up in housework raising her children has now become a reporter. This was possible thanks to the OhmyNews spirit of 'every citizen is a reporter.'" For lots of angry young Korean "Netizens" who felt their voice was perennially ignored by the overwhelmingly conservative Korean mainstream media, OhmyNews was a godsend when it was launched in February 2000. They were angry because the mainstream media constantly manipulated the nation's important agenda in politics, the economy and society for their own taste and purpose. Oh Yeon Ho, the founder of OhmyNews, left his job at a monthly magazine to test his ideas about this new form of journalism through the Internet. He deeply sympathized with these young Netizens in their anger against the mainstream media. In an interview with The New York Times in early 2003, Oh hinted that a part of his motivation in launching OhmyNews was to fix this skewed Korean news market: "We have a real imbalance in our media-80 percent conservative and 20 percent liberal-and it needs to be corrected. My goal is 50-50." More recently Oh has written of his original vision that he "wanted to start a tradition free of newspaper company elitism where news was evaluated based on quality, regardless of whether it came from a major newspaper, a local reporter, an educated journalist or a neighborhood housewife….So I decided to make the plunge into the sea of the Internet, even though I feared that which was different from what I was accustomed." Many young Koreans who were already sharing their thoughts on the Internet found that it made infinitely more sense to write for a news media with a strong national brand and formidable presence in the news market than scribble their anger in a puny blog. Goh Tae Jin, a citizen reporter turned cyber columnist shared his revelations about how he felt when his harshly critical piece appeared on OhmyNews in 2000. In it, he attacked one of the nation's top newspaper columnists for "factionalism and arrogance" that he'd exhibited in his column. "Unexpectedly, my article was chosen as the top story and suddenly sparked numerous heated opinions. It was an astounding experience for me to have for the first time in my life. On that day, OhmyNews transformed me from a reader into a reporter, true to its motto that 'every citizen is a reporter.'" Typical citizen reporters write a story or two per week. After submitting a story, they can track their status. Stories remain as "Saengnamu" articles before being accepted by OhmyNews copy editors. Once accepted, citizen reporters can follow the status of their words in real time, observing the number of readers' clicks into each of the stories, the number of comments, or the money collected in the "tip jar." What happens on OhmyNews is an intensely interactive online conversation. Citizen reporters have to persuade OhmyNews' front-line copy editors to have their stories accepted in the first place. As much as 30 percent of daily submissions are rejected for various reasons such as poor sentence construction, factual errors, or its lack of news value. After stories are accepted and edited, then placed in a more prominent space, usually within minutes they draw scores of readers' feedback. When the story is controversial, as in the case of Goh's, the number of readers' comments can shoot up to hundreds and even thousands. This feedback from readers, coupled with editorial advice by OhmyNews' copy editors, gives citizen reporters invaluable lessons in writing. A quick online search through the OhmyNews database yields 500 to 600 stories for some of our diligent citizen reporters and the difference of quality between their first and more recent writing is remarkable. Nearly 70 OhmyNews citizen reporters now have contracts to write books. If you believe, as I do, that an adequate level of writing skills is an important ability for citizens to have in a civil democracy, then OhmyNews' citizen reporters can proudly be named the most capable practitioners of "the Emersonian vision of an expressive society." The New York Times-and many other prominent news organizations-appear to consider the Web as simply another format in which to sell their news content. They sold the news once in the paper medium, now they will sell it again to an online audience and increase the return on their investment. For OhmyNews, the Web is seen neither as a channel for information flow nor as a pipeline for news delivery. It is a playground for our readers, a cyberspace for Netizens. In accepting this Internet vision, a whole new horizon opens for us. The readers, or news audience, are no longer passive consumers of news produced by a few privileged, arrogant reporters. They are active producers of the news they will consume at the end of the day. Participation in this great news sphere is realized for them either by joining OhmyNews as a citizen reporter or by participating in the online forum offered at the very bottom of every story we publish. Only as an afterthought did it dawn on us that the audience is the real content on the Web. Like any nimble disk jockey in a cool nightclub in town would do, we gave them a place to hang out and mingle in with the brightest minds in Korean cyberspace. One survey by a major Korean portal revealed nearly 40 percent of users' daily mouse clicks on it were for user-generated content, such as readers' comments and blog posts. A similar result was also found for OhmyNews. OhmyNews readers generate on average somewhere between 30 to 50 percent of daily traffic on the Web site through their participation in various online forums (other than their reading of the news). This is surely a wealth of eyeballs that any shrewd advertiser would salivate for. The "audience as the content" model makes a lot of sense for our business as well. For many, citizen participation on a news site seems identical to blogging. But while Weblogs stimulate colorful outpourings of citizens' voices on the web, most of time a blog is one-person operation and many bloggers are pursuing their journalistic passion at their own peril. Without adequate advice from trained journalists, they risk being ensnared into potential legal disputes involving, for example, a defamation case. The OhmyNews model is fundamentally different. We believe bloggers can work better with professional assistance from trained journalists. On the other hand, we also believe professional journalists can expand their view and scope greatly with fresh input from citizen reporters. News media as a whole can offer more diverse and rich content to readers by tapping into the wealth of Netizens' collective wisdom. Unlike Wikinews, which restricts their oversight role to a "janitor," OhmyNews works as a convener by actively promoting conversation among editors, citizen reporters and professional journalists. (We also, however, have a cyber janitor to clean up any mess that might be left in the aftermath of fierce online debate.) However, there seems to be a subtle division of roles between the OhmyNews staff reporters and citizen reporters. Citizen reporters understand that instead of copying the styles of trained journalists, they will shine brighter when they remain true to themselves. Citizen reporters excel when they write something they understand well and have a strong inkling for. No story is published before it goes through an extensive screening and copy editing process. Citizen reporters realize their edited text looks better with snazzy headlines and sometimes eye-catching thumbnail pictures. They also find their stories more polished after proofreading and editorial retouching by professionals, even if they occasionally face frustrating rejections of their stories. A recurring fear among journalists is that the coming age of citizen journalism would signal the end of "journalism as a serious profession." On the contrary, the OhmyNews experience shows that trained journalists will be in greater demand as an increasing number of "citizen journalists" start to produce explosive amounts of news themselves. Alas, if only journalists would understand how to reinvent themselves in this age of citizen journalism! OhmyNews editors spend a lot of time educating aspiring citizen journalists. We regularly invite them to our news room and give them "Journalism 101" classes. We encourage them to keep keen eyes on things going on and give advice that, if properly applied, would enhance the visibility of their writing as a means of effective communication. Recently, OhmyNews opened a new service feature in which our readers can participate in the editorial process by voting for their favorite writers or stories. OhmyNews servers collect the data and sort out the stories according to the number of votes each received. If we can define the first generation OhmyNews as "a massively distributed collaborative news operation on the Web," OhmyNews 2.0 can be described as "a massively distributed collaborative editorial participation on the Web." For example, when citizen reporters set up their personal blog site in OhmyNews, we encourage them to become an editor for their own edition of OhmyNews. They can drag and drop any of the few hundred stories available on OhmyNews each day to build their personal edition. Now every citizen can be an editor at OhmyNews. In OhmyNews 1.0, we tried to bridge the gap between pros and amateurs by introducing "journalism as a conversation" as opposed to "journalism as a lecture." OhmyNews 2.0 will continue to evolve with the development of more Web tools that will help us to harness the collective intelligence of Netizens on a global scale. All of the guys are already consequently thrilled to read them and already have without a doubt been enjoying them. Computer<a href="http://www.beatsstudioheadphonesonsale.com/">beats by dre</a> <a href="http://www.turbotax2012download.com/">turbotax 2012</a>an be divided according <a href="http://www.trxtrainerscheap.com/ ">trx</a>their size and <a href="http://www.quicken2013download.com/">quicken 2013</a> supercomputers, mainframe comp<a href="http://www.trxprokitsale.com/">trx</a>uters, midrange <a href="http://www.windows8softwaresale.com/">windows 8 key</a>ters, minico<a href="http://www.turbotaxdownloadfast.com/">turbotax download</a>mputer, microcomputer. The computing speed supercomputers over hundreds of millions of <a href="http://www.discountwindows8key.info/">discount windows 8 key</a>econd, the difficulty and high cost of production, so it is a measure of an important symbol of a country's level of computer technology. Only a few countries in the world have the ability to develop supercomputers, China is one of them. The microco<a href="http://www.quickenpersonal.com/">quicken</a>mputer is a new model <a href="http://www.64gbusbmemorysticks.com/">64gb usb memory sticks</a>in the 1970s, microprocessor (MPU) for the core group as "computer". Today, computer development in both directions toward the giant and miniaturization. Oh my! News by million phonecams? Mr. B is a man of routine. He takes the subway to school in Sinchon from his home in Jamsil. With the exception of a couple of streets he knows well, the only Seoul space that exists in B's head is the subway map between Jamsil and Sinchon stations. The rest of that city known as Seoul exists for him nowhere but in virtual space. B, who managed the none-to-easy feat of getting a job at a bluechip company in Yeoido, buys a car. Having to drive rather than take the subway, Seoul is now a completely new world. He discovers on the map roads that were outside his attention when he was moving about underground, and he's awakened to how beautiful Seoul's Han River is as he takes the Olympic highway for his daily commute. For B, who now doesn't go anywhere if there are no parking space, Seoul gives an entirely different spatial ambience. Even real space can appear completely different depending on the window through which you contact it. In that sense, you can tell that the subway or car is playing the role of media through which B's perception of space is controlled. Depending on what medium a person sees the world through, his or her perception of space also evolves. At first, there was real space. As I've already demonstrated, however, people have their own unique sense of that space, even if the space is the same exact one. With the arrival of the Internet, human history's most innovative medium to date, people have come to experience a completely new sense of space, i.e., cyberspace. Of course, people first accepted the Internet by trying to replicate the real space on the web with existing practices with which they were familiar. A Canadian experiment was typical. The Canadian government selected one village and installed broadband Internet, after which it observed what changes were apparent after members of the community began Internet communications. The results were quite different from what was expected, however. Rather than communicate with the people in their village, they jumped into the vast sea of Internet extending beyond their geographic location and began sharing a completely new form of communication with total strangers throughout the globe. The Internet created cyberspace, a global cyber community that far exceeds the boundary of real space. In the last 10 years from the full-scale introduction of the Internet, the entire world has welcomed and marveled at this New World of cyberspace, and despite the spectacular dotcom bust, that fervor has yet to cool. The wild enthusiasm for the possibilities of cyberspace as a method to overcome the limitations of real space in the United States is largely due to the nation's vast territory, in which it takes more than five hours to transverse the country by air. For Americans, whose exchanges were inevitably limited due to geographic distance, cyberspace was the only real alternative. In a nation like Korea, however, with a high population density and over 70 percent urbanization rate, the very same Internet took on quite different characteristics, as we could see. For example, there was the so-called beongae or "lightening" phenomenon demonstrated by the "I Love School.com" craze, in which Korea was so caught up by this cyber reunion service that at its peak it was impossible to make reservations at restaurants on the weekend with everyone meeting each other. In the United States as well, there is the Internet school reunion site Classmate.com, but with classmates scattered all over such a huge country, it was realistically impossible to hold a snap weekend evening "lightening" gathering by placing a single note on the site's bulletin board. Accordingly, the U.S. alumni reunion site was one that was inevitably limited to a phenomenon that could occur only in cyberspace. On the other hand, Korean cyber alumni sites and the countless Internet cafes spawn lightening meetings almost without exception. In the Seoul metropolitan area, nothing is farther than a 30-minute subway ride away, and even in the provinces, one could make it a weekend trip if they really wanted, so lightening meetings are always possible. If there is such a meeting, the following classes always follow with their own cyber reunions, and those who fail to show up at such reunions naturally begin to grow estranged in the conversations of those who attended, even in cyberspace. In the end, there are cases when those who participate in the lightening reunions have seized control of the bulletin boards. Interaction in real space has begun to influence the operation and form of cyberspace. In this "lightening reunion effect" one could infer the idea of "hypersurface," raised by new-generation architect Stephen Perrella in his book "Hyper Surface Architecture." The idea runs that the sense of space obtained through experience in cyberspace is superimposed on real space, while experiences in the real world influence cyberspace, creating a third space which isn't real but isn't cyber. I shall borrow Perrella's pioneering idea and refer to the world after cyberspace as "hypersurface" for further discussion. What kind of sense of space would hypersurface give us? Or before that, what kinds of things could occur in hypersurface? Firstly, in order to create true hypersurface, we must premise it on an "ubiquitous" environment in which people could access a network anywhere at anytime. In other words, just as the Internet gave birth to cyberspace, the ubiquitous environment shall inevitably give rise to hypersurface. Let's look at a scenario that could take place in hypersurface. Mr. B, with his next generation mobile handset, finds an eatery near his office. As he passes one restaurant, basic information about the place, along with comments left by customers who had eaten there, pop up on the screen of his handset, which is registered for a LBS or location based service. In just a glance, B could decide whether or not he wishes to eat at that particular restaurant. After eating, B could leave a comment of his own concerning the restaurant, or do nothing. It's a cyber bulletin board that exists exclusively when space, time and conditions are correct, but it is as if it were a real bulletin board with customer postings hanging right next to the restaurant door. This is hypersurface. Now rewind your memory to Korea's presidential impeachment crisis in March. 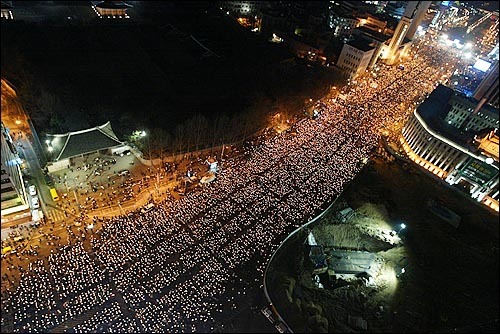 Those opposed to the impeachment held large-scale demonstrations at Gwanghwamun and held events for six hours straight that resembled carnivals. OhmyNews reported from the scene, but with a crowd of 200,000 people flowing all the way down to City Hall, there was no way for people at the rear of the procession to know what was happening on the podium. In the end, as strange as it may sound, it was easier for people who were following OhmyNews' on the scene reporting to know what was going on than it was for people who were actually there. If OhmyNews had been able to use location information to send text messages of what was happening on the podium in real time to all 200,000 people gathered at the demonstration, the crowd could have enjoyed a much more dynamic gathering. One could compare this with baseball fans who bring their radios with them to the ballpark to listen to professional commentary as they watch the actual game. This was a hypersurface experience that could have happend, despite the technology and infrastructure was already there for immediate use. There is countless tourist information posted on major portal sites. OhmyNews citizen reporters, too, like to write stories about their own trips or places to travel to in the areas where they live. We could imagine a service in which OhmyNews stores such articles according to its place, time and season, and relevant articles appear on the screen of those readers who have subscribed to a location information system carrying mobile devices as they travel. Readers could respond to travel stories by citizen reporters and additionally leave their own feelings on the comment section upon arriving at their destination. It's a moment when hypersurface materializes; cyberspace and real space fuse together. Just as cyberspace grew rich not as a result of a hierarchical relationship between content providers and consumers but through spontaneous interaction between Internet users, we will be able to experience the true taste of hypersurface when one is able to make it not a unilateral information service provided by dotcom heavy-weights, but a place where users exchange their own ideas and opinions in a dynamic place as they freely move between cyberspace and real space. What is Hypersurface? It is a whole new breed of hybrid space where everything is teeming with live information feeds. To borrow a line from the trailer of 'Ghost in the Shell: Innocence', the newly released sequel of the Japanese anime cult classic, the line between real and cyber space will blur beyond distinction in Hypersurface. Many find themselves bewildered and confused by the new hard-to-pronounce technologies of the 'ubiquitous' environment, but this is the nature of things to come. tory Outlet is really sizzling kinds of shopping way for you. With the usage of the replica designer coach bags, you can surely be able to change your individual looks in a stunning manner. Love discount herve leger classic design, still in love with the herve leger dress sale fashionable trend; Fond of herve leger on sale simplicity, but herve leger bandage dress still keen on the noble and elegant style. Do you always have these herve leger black dress contradictory thoughts, and trouble with being unable to get herve leger dresses them all? 2012 hot sale Chest wrap Strapless back white herve leger dress; will satisfy your desire in your deep heart,herve leger v neck dress with the classic fashion, simplicity, and being elegant in one herve leger gold bandage dress. You are not contradictory, because you are yourself now, with never-get-tired glamour. Not longer hesitation, come to Spring 2012 New Arrival Dress store,http://hervelegerdressessale.net/, where you can make yourself what you dream of. Nike CTR360 Maestri II Elite FG - White/Blue/Black,Adidas adiPURE 11Pro SL TRX FG - Blue/Black/Green,Mizuno Wave Ignitus 2 FG - Yellow/Black,Puma King Finale Football Boots - White/Nevy/Blue and so on are made for high performance- offer you great comfortable fit when touching, dribbling the ball, still it will render you high stability, allowing you running at high speed and cutting through anytime you want. Its lightweight material reduce your burden, enhancing your speed and agility in the pitch.If you want to know more,come here:http://cleatsbag.com/. Here coach outlet stores is more Ever attention how parenthood inspires a coach online outlet whole new speech? We call these words Nominations. Perhaps you acknowledge a coach website few of these new of children rearing terms that coach handbags outlet online haven't positively made it into coach outlet coach handbags factory outlet Webster's--yet. Conclude from some of our Nominations, coach backpacks for school and after you've had a devout chortle, have a funny coach laptop bags for women feeling openly to submit your own Nominations in the comments below!Coach handbags coach wallets for menhave become one of the most luxurious fashion coach sunglasses on sale handbags in the world, and coach tennis shoes they come with their excellent quality and unique design. Coach coach charm bracelets started its handbag industry in 1941, cheap coach shoes and until now, coach handbags coach keychains have been considered as the most popular handbags. http://cheapcoachoutletonlines.com/.